Who wouldn't wanna dig in those lip treats that remind you of your favourite bakery item, especially when the treats consist of Tiramisu and Red Velvet Cake? We all would, riiiight? And, it would be an added incentive to be able to take care of our lips, yaaaas. 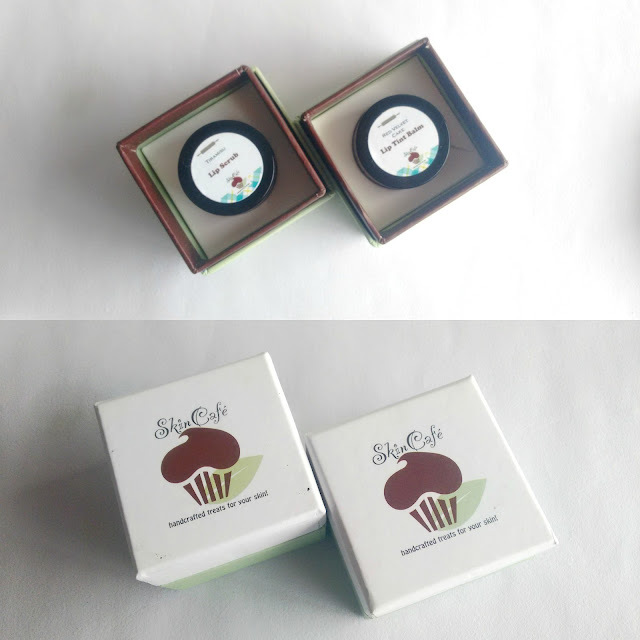 Today, I will be talking about the yummy lip treats that go by the name of Tiramisu Lip Scrub and Red Velvet Cake Lip Tint Balm which were sent to me by the brand, SkinCafe. We believe in clean green options with minimal to zero use of chemicals and synthetics. We stand for handcrafted luxurious skincare treats using fresh, natural, plant-based and organic ingredients. We oppose animal testing or use of animal-based contents in skincare and cosmetics. We rely on premium quality ingredients and meticulous research rather than on flashy marketing gimmicks. We look for healthier, greener and sustainable alternatives for everything in life. We aim at vegan and vegetarian raw materials even if they are harder to source than cheap synthetic alternatives. We work towards bringing high-value skin care to the knowledgeable and discerning buyer. Coffee Beans, Sesame Seed Oil, Cocoa Powder, Skin/Food Grade Fragrances. To take all round care of the lips, it's very important to scrub the lips at least twice a week with a lip scrub, preferably made up of natural ingredients and no chemicals. Lip scrubs remove the dead skin cells from the surface resulting in smooth and pink lips. Tiramisu Lip Scrub from the house Skincafe, ticks all boxes. Made up of coffee beans, sesame seed oil, cocoa powder, the scrub has a very wake-you-up sort of fragrance of coffee. There's a cardboard box which houses the glass jar that contains the scrub. It comes with a spatula, which is used to scoop out the required amount of the product in order to avoid contamination of the product by using wet/dirty fingers or spoon. I take the required amount and gently scrub damp lips with my fingers. The scrub has a slight coarse texture but it's not very abrasive. It provides the right amount of exfoliation for my dry lips without drying them further. The scrub contains a generous amount of coffee, which contains a compound known as caffeine, that gives the lips a fuller look and makes them plump, naturally. I have been using the scrub from the last 5 weeks and I can definitely vouch for the fact. With regular use (i.e. twice a week), my lips have become pinker (my lips are not pigmented), plump and soft, with dead skin cells getting discarded completely. I have also noticed my lips looking firmer with every use. One thing that you do have to make sure is that you immediately follow up with a hydrating lip balm that contains no chemicals or you could also go for Red Velvet Cake Lip Tint Balm from the same brand. To sum up, I would recommend this lip scrub to everyone! The aroma is very refreshing and the results are even marvellous. Beeswax, Cocoa Seed Butter, Shea Butter, Olive Fruit Oil, Magnesium Stearate, Skin/Food Grade Fragrances, Approved Cosmetic Grade Colours. 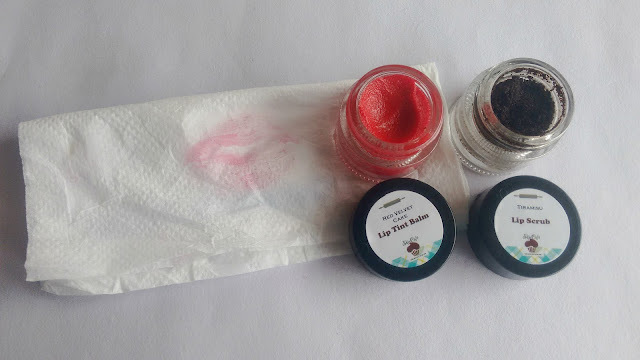 The product comes in a super cute cardboard box which houses a glass jar that contains a beautiful looking red coloured lip tint which screams luxury. Since it's glass, the jar is heavy and if you plan to travel with the product, it's best advised to store it in the cardboard box in order to avoid any mishap. With a tint that is build-able and is made up of a stellar ingredients list which boasts plants based oils and butters like shea butter, cocoa seed butter, olive fruit oil etc and approved cosmetic grade colours, I wonder why wouldn't anyone want to pick it up in a heartbeat? SkinCafe Red Velvet Cake Lip Tint Balm smells deliciously of red velvet cake and works in twin ways as the name suggests. It's a lip tint + a lip balm which is perfect for those times when you want a hint colour on your lips but do not wish to wear a lipstick. The lip tint gives a very nice sheer red tint which looks flattering and hydrates the lips very well but if you have chapped lips then this product is not for you, as I didn't find it insanely moisturising to the point where it would heal chapped lips. The formula/texture is very light and applies easily on the lips and it does not feel heavy or uncomfortable. What I absolutely love about the product is that the tint is build-able (you need like 2-3 swipes) and stays put for a good number of hours with slight munching in between. Please do not expect it to survive a proper meal as it just your good ol' lip tint at the end of the day. All in all, I really loved the product! It may not be insanely moisturising but the beautiful tint that it lends to the lips makes up for that. The products are made using plant based oils and butters. USDA certified organic essential oils (let me tell you, very few Indian brands use USDA certified oils). Both the products smell really really good. Red Velvet Cake Lip Balm provides a lovely tint to the lips. The tint stays put for a decent number of hours and can actually survive light snacking. The lip scrub exfoliates the lips gently without drying them. The lips appear pinker, plumper and soft with consistent use (i.e. twice a week). The lip scrub comes with a spatula to scoop out the product. The packaging is truly luxurious. The products are made to order. The lip tint is not very moisturising. Carrying both the products along with their outer cardboard boxes become a bit inconvenient. 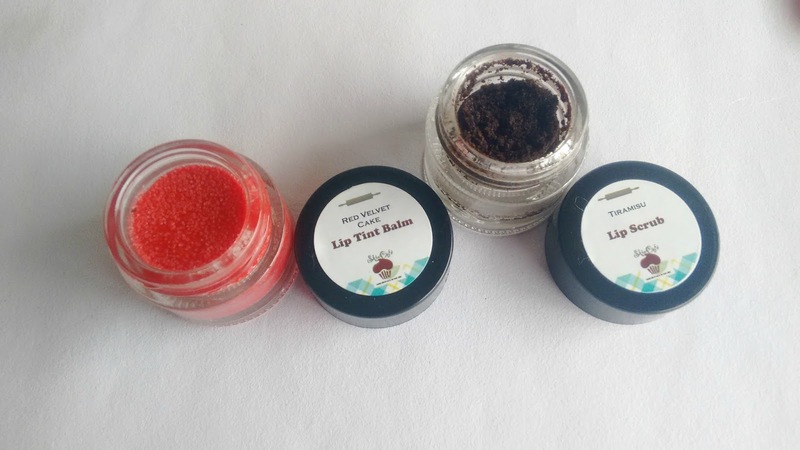 The lip tint balm is priced at INR 900 for 9 grams and the lip scrub is priced at INR 950 for 9 grams. The products are pricey, but the quantity and quality make up for it. If used wisely, the products will surely last long. The products can be purchased directly from brand's official website HERE. There is absolutely no reason why I would not! Has any of you used any product by SkinCafe or is eyeing any product(s) in particular? Let me know below! Disclosure: The products featured in this post were sent to me as PR samples for review purposes, however, the opinions expressed hereby are strictly unbiased, based on my personal experience with the products.